The new VT40X and its stablemates have extra added zing in many departments, making them even more desirable. Great dynamic range. Tone Room editor. Vox introduced its Valvetronix amps way back in 2001, and they're still going strong today, outlasting most of the modelling amp competition along the way. There's no real secret to this; they sound superb - and while they aren't the cheapest, the sounds and build quality more than compensate for that. After such a long time, however, it was clearly time for a refresh, which has given us the newer, better VTX series. The 40-watt 1x10 VT40X has a restyled sealed cabinet, with a clever bass reflex design to enhance the 10-inch driver's bass response. Inside the chassis, there's a new digital signal processor that, along with other components, takes advantage of 15 years of technological progress to offer more realistic sounds than ever before. "The VT40X's sounds have really improved with more focus and detail." This is where Vox has leveraged the considerable digital expertise of parent company Korg, using its VET (Virtual Element Technology) modelling system to simulate each amp down to the last component, changing gain structure, tone network, operating class and bias, all in real time. On the surface, the VT40X's control panel looks quite similar to the old Valvetronix amps, but with some new features, most notably the class and bias buttons. These allow selection of class A or class AB, as well as shifting the bias voltage from normal to either cold or hot modes. Both buttons change the VT40X's dynamic response, affecting the Valve Reactor circuit, which uses a real 12AX7 valve to provide more realistic valve-driven tone and response. While the preamp is digital, this digitally controlled analogue part of the amp adds significant warmth and dynamics, which is still difficult to capture in the digital domain. The VT40X's sounds have really improved with more focus and detail. 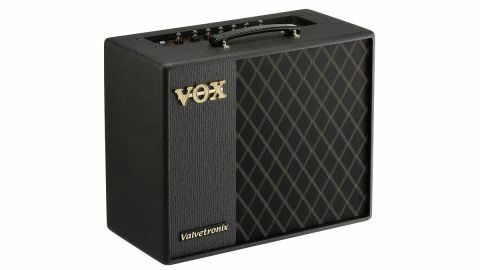 The Vox models are uncannily realistic, especially the AC30TB, which captures the original's class A grind and vocal solo voice. Other old favourites such as Boutique OD (based on a Dumble) and a Double Rectifier have more dynamic range, with a sweeter, more detailed top-end that comes almost uncomfortably close to the real thing. The effects are equally impressive, with a choice of 12 onboard modulations, delays, reverbs, overdrives and distortions, as well as a handy noise reduction. But the fun doesn't end with what you get out of the box; Vox's Tone Room editor software allows in-depth editing of parameters, adds extra models and effects and lets you save personal favourites offline, in addition to eight patches you can store on the amp itself. You can also sample other user patches, which can be a great help for newbies.